"Patience, simplicity, and focus" may sound like a fortune cookie dictum, but it's actually a trio of brilliant investment strategies. It doesn't take a superhuman math genius with access to a flawless crystal ball to build a great retirement portfolio. Successful investors share a huge number of common strategies and attitudes -- and many of their secrets can be copied from the comfort of your own home. We asked three Motley Fool contributors to share the secrets to the success of the smartest investors on the market. They came up with the wonderfully plainspoken trinity of patience, focus, and simplicity. Coca-Cola (NYSE:KO) was held up as an example from Warren Buffett's market-crushing history, with plenty of illustrative quotes from masterful investing gurus along the way. Warren Buffett surrounded by analysts and investors at Berkshire's 2014 annual meeting. "The goal of the non-professional should not be to pick winners ... but should rather be to own a cross-section of businesses that in aggregate are bound to do well. A low-cost S&P 500 index fund will achieve this goal." While at first these two statements may appear contradictory, they are actually quite consistent. Buffett intended the first statement to be advice for investors who do not have the time or inclination to study businesses in hopes of correctly choosing those that will outperform the market. Buffett's second statement describes his personal approach to investing. While it may be tempting to dismiss a concentrated investment strategy as something only master investors like Buffett can successfully accomplish, I do believe this concept can also benefit non-professional investors. To help in this regard, I manage a highly concentrated real-money portfolio for The Motley Fool. By focusing on my best ideas, I've significantly outperformed the market -- and, more importantly -- helped Fools who have followed along do the same. Start with calm, dispassionate stock analysis. Holding on to your winners for decades on end unlocks its own special magic. Getting excited about your favorite stocks sets you up for all kinds of misjudgment and disappointment. It's better to do your homework -- and thoroughly -- on great businesses, and then take action when the best stocks get cheap for all the wrong reasons. "We don't buy cheap stocks. We look for quality businesses we want to own and wait until they get cheap," says Vulcan Value Partners manager C.T. Fitzpatrick. "When the conditions are right, you can catch some really big, beautiful fish." Later in the same interview, Fitzpatrick added: "There are companies that I've personally followed for my entire career, waiting for the chance to buy." The other type of patience shows up in most biographies of master investor Warren Buffett. Buffett's favorite holding period is "forever," because that's how you open up the treasure chest of compound interest. That's particluarly important when you're buying dividend stocks. 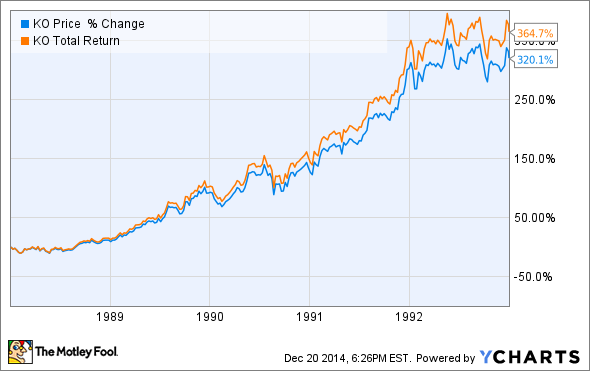 For example, Buffett started buying Coca-Cola shares in 1988. He could have sold those shares five years later for a handsome 320% return on his investment, or 365% with dividends reinvested along the way. But he didn't. 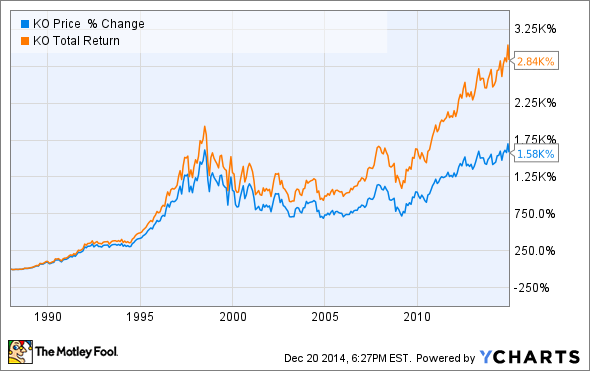 Buffett still owns Coca-Cola today, and a much larger stake at that. His original investment has soared to a 1,580% return -- or 2,840% when accounting for dividends. That's nearly 30 times the original investment. The $1.22 annual dividend per share these days nearly covers the cost of a split-adjusted Coke share in 1988. Day traders will never experience the joy of truly game-changing dividend checks, or the massive returns they unlock. But stone-hearted, dispassionate investors with stoic reserves of patience can unlock this magic -- and they do. Especially if they started from a solid analysis and bought when the price was right. So turn off your Bloomberg and CNBC screens, grab a cup of strong tea, and focus on the long run. It's how the real pros do it. Andrés Cardenal (Simplicity): Highly successful investors don't necessarily follow complex and sophisticated strategies. On the contrary, simple ideas can be far more powerful when it comes to generating superior returns from your investments. Peter Lynch, investor extraordinaire. Source: Lynch alma mater Wharton at UPenn. Investors should remember that their scorecard is not computed using Olympic-diving methods: Degree-of-difficulty doesn't count. If you are right about a business whole value is largely dependent on a single key factor that is both easy to understand and enduring, the payoff is the same as if you had correctly analyzed an investment alternative characterized by many constantly shifting and complex variables." Peter Lynch said it in a succinct and colorful way: "Never invest in any idea you can't illustrate with a crayon". Many individual investors feel they are at a disadvantage when competing against investing professionals and all their financial and technological resources. But the good news is that you don't need to be a rocket scientist with a access to a supercomputer to do well in the markets over time. Successful investing can be surprisingly simple.